Summary: This review is unusual. Normally, these pages look at just one product. This time I have covered two vibration plate exercisers together. Both are from the same maker, Bluefin. Both have plenty of positive feedback from previous buyers. The difference is that one is a 2500w floor-standing model, and the other a 3900w model with a hand rail (and much bigger engine). You’ll get free UK delivery with both. There is also a comparison chart, showing the specs of the different vibration plates side-by-side. You can find it around half way down this dedicated amazon.co.uk product page (just before the comments). The Floor Standing Model: This unit comes in slick black, with a slightly lined surface plate for extra grit. The 2500 watt motor is powerful for this type of unit, and gives you two advantages. First it helps to keep the machine quiet. If you have every heard a vibration exerciser with a motor struggling to keep up, then you will know the type of sound you really don’t want in your home! Second, the smoothness of the vibrations is affected by the motor size. 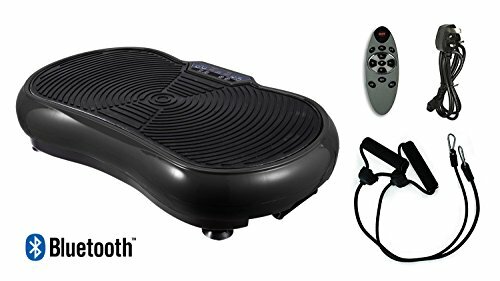 You’ll get a remote control with this model, which is a must-have if you do not want to be stepping on and off to make adjustments while you work out. There are also hand grips on elasticated bands. Some of your routine will involve standing, braced, on top of the unit, others are floor based, with some of your weight on the plate. The Upright Model: This crazy-fit model uses a lot of the same tech, though the engine is even bigger (smoother, quieter!) and there are bars coming up from the unit. These are for safety as much as anything, and do give people the peace of mind – especially for those first few sessions. With this type of model you get a control panel, so the remote control is not needed. You will still get the elasticated hand grips though. As usual, the first thing I do with reader comments is to look for an overall theme. This time the words that appeared most often are ‘love it!’ and ‘excellent’. Overall the feedback is very positive. Some complaints about the weight are in there. Without going too far into the laws of physics, these things need to be heavy to effectively vibrate… several people ‘complained’ about muscle soreness too. This can certainly be taken as a positive, since it shows that their training sessions have had an effect. After reviewing and comparing many different vibration plate exercisers, there is little doubt that these are effective. Once you check out the comments, I am sure you’ll reach the same conclusion. Bluefin offer solid vibration plate trainers for a reasonable price. When you compare the engine size and intensity levels, this is a great value machine. When you first get on, the wobbles might surprise you – though after a few sessions the toning effect could mean there are far fewer wobbles around. Check out those buyer comments, and see the picture gallery for yourself on this dedicated amazon.co.uk product page. You’ll find the comparison between the bar / no bar models around the half way point.